February is the month of love, passion and togetherness all wrapped up in a bow called Valentine’s! For Monaco Sun Events, February is the beginning of their intense busy season. It’s their moment to make fitness stars and body builders shine on stage. They’ve worked hard and have become the official tanning and beauty services company for Ultimate Fitness Events (UFE) shows, FeFA, and Mr & Miss CHIN International Bikini Pageant. Louise Dudley owner and master chef has been the face and body of Monaco Sun and now Monaco Sun Events for over 15 years. 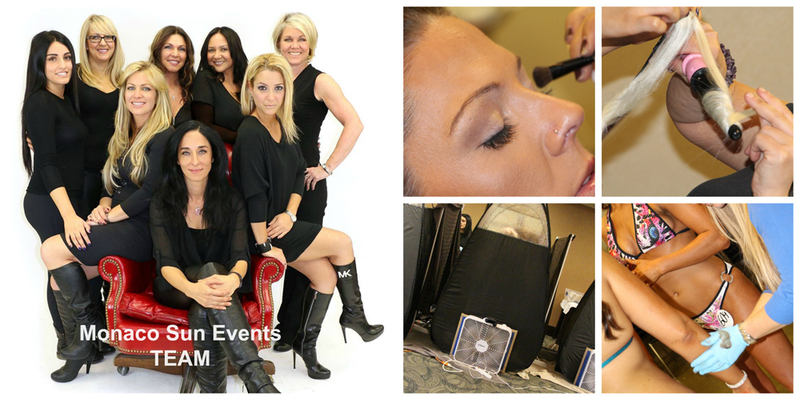 Every airbrush technician on her team is specially trained giving you that perfect spray tan in seconds. Hair, makeup and spray tanning all under one roof by one great team. Read our interview with Monaco Sun Events and see how they hustle and bustle to make their clients look fabulous! 1. Please take a minute to introduce yourself and your business? My name is Louise Dudley and I am the owner of Monaco Sun Tanning Salon and Monaco Sun Events. We started Monaco Sun Tanning Salon in 1998 originally providing strictly uv tanning. In 2008 we brought in airbrush tanning and loved it! Over the last 6 years we have transitioned our salon business by eliminating the uv tanning beds to solely offer airbrush tanning thus becoming the first sunless tanning salon in the GTA. Monaco Sun Events originated in 2012 to service large volume events tanning and beauty services for fitness competitions. 2. What are the Benefits of Spray Tanning? Spray tanning has become one of the largest growing services in the beauty industry because it is convenient and because it is the perfect alternative to uv tanning. Our present-day lifestyles are extremely fast paced and in most cases “free time” is a luxury many of us don’t have. The beauty of spray tanning is that we can achieve the same tanned-look in one spray tan application that 6 uv sessions (or more depending on skin tone) will achieve. Spray tanning is also the perfect alternative to get that tanned glow for those who cannot tan or choose not to tan. In many cases people who uv tan will also spray tan to obtain a darker tone and to even out existing tan lines. 3. What is the best piece of advice you can give to new sunless tanning businesses? Get properly trained. A technician should be aware of all aspects of this beauty service to ensure excellent customer service and repeat clients. Use good quality equipment. You should never substitute quality and durability for price. The technician is only as good as the equipment they use which is why I only use fujisprayTAN™ systems for both the salon and for onsite tanning. Always have extra parts on hand to be prepared for unanticipated mishaps. I would recommend having an extra Connector, Pressure Tubes and applicators. Invest in an extra hvlp system to have on hand. NEVER plug your hvlp system directly into a wall socket, ALWAYS use a power bar. When I first started out I had a mobile appointment in an old building. I had plugged my hvlp into the wall socket and there was a power surge, which I was told is quite common in older buildings, which literally blew my machine. Thank goodness I had a second machine with me and I was able to continue my work with minimal interruption. From that day I always carry a few power bars with me to use. 5. Which fujisprayTAN™ equipment do you use and why? I don’t have a favorite system. I use them all. The salonTAN™ models are in my salon because they are quieter then the smaller miniTAN™ or hvlpTAN™ systems and don’t disrupt any of the other services we offer. I use the miniTAN™ models for my mobile services when I go to people’s homes for bridal parties or group bookings because the machine is smaller and easier to carry. The miniTAN™ models are also metal so when I’m transporting and moving then from one location to another I don’t have to worry about them getting all banged up. I use the hvlpTAN™ systems for my events. I usually carry about 4-5 machines with me to each event and will pack them all in one bin which is easy to carry because the hvlpTAN™ machines are very light-weight. 6. Would you recommend fujisprayTAN™ system to others and why? I would absolutely recommend fujisprayTAN™ system to others. Whether you are a salon owner looking to supplement your business income, or a stay-at-home-mom who wants to supplement the family income with a flexible part-time job or an entrepreneur who wants to start a mobile tanning company, Fuji has a variety of machines for you. Their prices are competitive but their quality and customer service are unbeatable. 7. How long have you been involved with UFE as their Official Spray Tanning Company? Monaco Sun Events has been the official tanning and beauty services provider for the Ultimate Fitness Events (UFE) for 3 years. We are also the official tanning and beauty services provider for FeFA and CHIN. 8. Tell us a bit about your behind the scenes experience at an UFE show? I can think of two words to describe backstage at the UFE shows..Pandemonium and Exhilarating. It’s very hard work with absolute time deadlines but it’s so rewarding. 9. Tell us your funniest/embarrassing spray tanning experience? As I mentioned above, it’s very hard work with absolute time deadlines so I’m working on adrenaline from 6:00am to about 7:00pm. At times fatigue catches up and one time I was bending down to spray the back of the legs of one of my female fitness competitors and as I was starting to rise up I got tired and involuntarily fell forward and my head hit her bum! It caused quite a laugh from everyone around – laughter is always the best stress-reliever so it all worked out well. When you look great, you will feel great! Awareness and education are the keys to most success stories and as it’s been said time and time again…Knowledge is power! If you have the desire to succeed the next step is to be prepared with the right tools and understanding of the industry and materials currently available, these are all the elements that have pushed Louise and her team to the top in this industry. You can achieve that too….Take the challenge and invest in fujisprayTAN. Click Here to see a video of Monaco Sun Events in action!